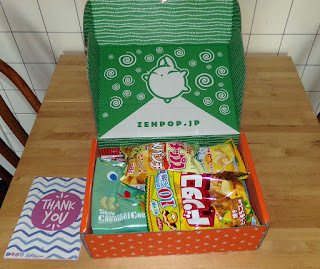 It may seem these days that the only Japanese snacks that I review come from ZenPop. Well, that's because that's the case. They provide the best value box for the money and they also send me free boxes. If I had to pay, I'd buy from them, but I'm just as happy not to pay. When I lived in the Bay Area (of California), I was lucky to have access to shops that sold Japanese food at seriously inflated prices. There is one Asian market about an hour away from where I presently live, but its selection is weak and the prices are even higher than those I'd previously paid. That has dampened my enthusiasm for seeking out new snacks as it's frankly depressing seeing the same bags of KiKat matcha mini bars for $12 and little else during every visit. These boxes are a spirit lifter when they show up with an assortment of things I haven't seen for many years now. 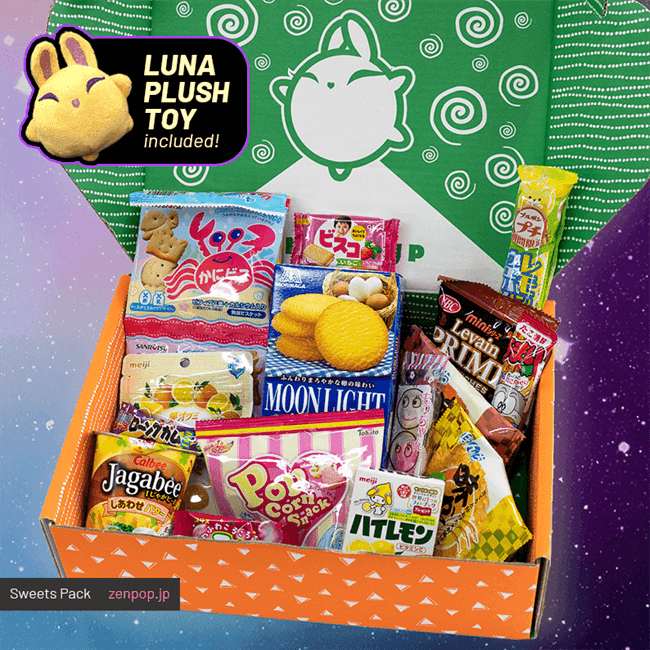 This box includes a mix of salty and sweet with an emphasis on things which won't melt in the heat of summer. Since I'm currently living in a place where temperatures at their highest can reach 100 degrees, this is something I'm grateful for. There are a few chocolates in the box and I'll be curious to see how they fared on the trip when I get tto reviewing them. In terms of what I'm excited about, the first thing is the chocolate mint caramel corn. The regular caramel corn is already one of the most enjoyable snacks you can get from Japan (and overlooked in favor of the flashier, but often less enjoyable KitKats) and a variation on the flavor has great potential. This isn't like other corn puff snacks. It's light, crispy and almost melt-in-your-mouth. I am also quite interested in fettucine gummies and seeing how they differ from regular ones in texture. 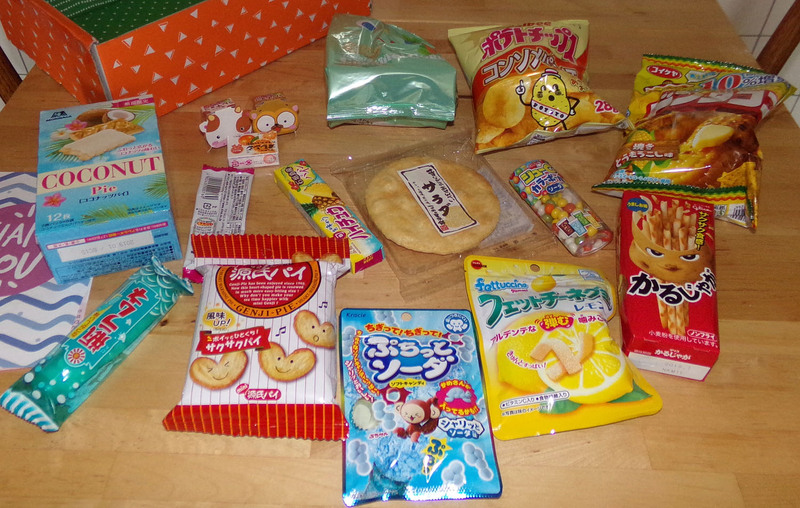 Japanese gummies, in general tend to be more flavorful, less sweet, and have a better chew than American ones. The shape may also lend a different experience to them. Of course, because I became a sembei fan late in my time in Japan, I'm looking forward tot he "salad" sembei. "Salad" is a funny flavor in Japan. It doesn't seem to mean anything related to what we'd call salad and my experience with it has meant a more "salad dressing" (vinegrette) type of experience. We'll see how this one tastes. In terms of things I'm fairly indifferent to in this box, that would be the kid's stuff and the orange marble gum in particular. It's not that the gum isn't tasty. It actually is, but I've had it before and the flavor lasts about a minute then it's just plain jaw exercise. I think the dagashi (kid's) snacks are more appealing to people who haven't lived in Japan for a long time compared to me. They are the most colorful and often the most unique, but they also have the simplest flavor profile. Still, I will be reviewing them with an eye toward their intended market and as novelties and not through my very narrow lens. 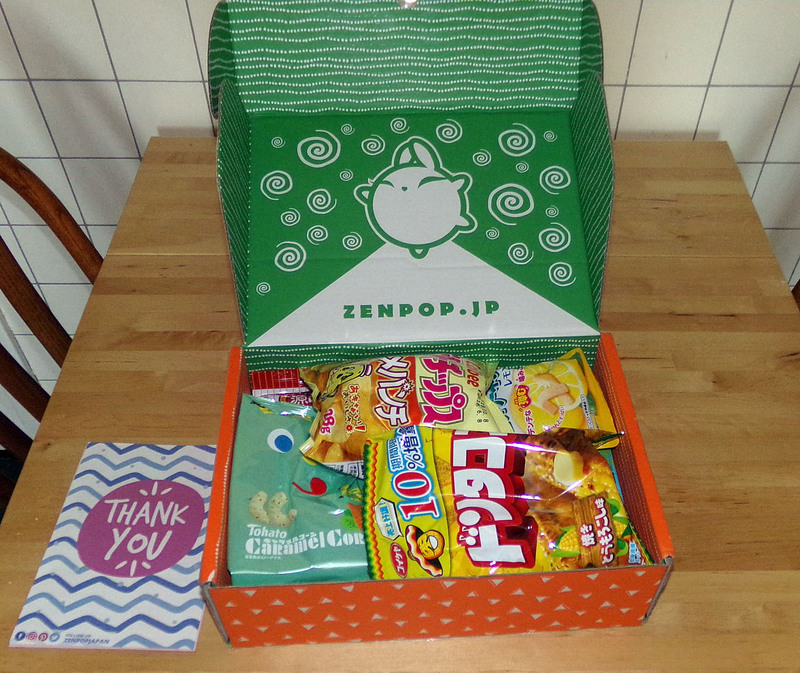 If you'd like to get your own sweets box, the September box is available for ordering at ZenPop and it has a nice bonus compared to the one I'm reviewing. There's a "Luna" plush which is adorable that is included with that box (at the same price as regular boxes). It's a pretty good deal in general, but it's even better in the coming month. I'll be back very soon with a flurry of reviews of the contents of this box.